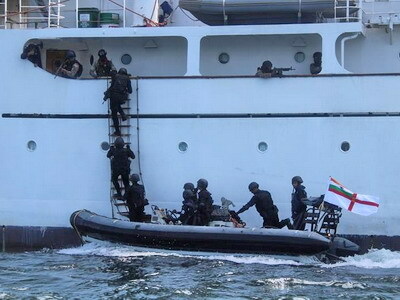 The South African Maritime Reaction Squadron (MRS) conducted a boarding exercise as part of Exercise Ibsamar that took place between the South African, Brazilian and Indian navies off the Western Cape. The SA Navy said the boarding exercise took place last week and involved a ten-member action force and three boat crewmembers. The ships that were involved in the exercise were the SA Navy’s SAS Amatola and SAS Protea, the Indian Navy’s INS Tarkash, and INS Kolkata and the Brazilian Navy’s BNS Barrosso. The MRS team were flown aboard an Oryx to intercept the SAS Protea, which was acting as a vessel of interest. The SA Navy said a successful fast rope onto the flight deck of the SAS Protea was executed. The MRS team was tasked with securing the deck and personnel, and once it had done so a boarding team from INS Tarkash arrived via boat and boarded SAS Protea. A full search and seizure was conducted and resulted in the discovery of ‘contraband cocaine’ as well as ‘contraband’ on crewmembers, who were subsequently detained. Ibsamar commenced on 1 October, with the first sea phase taking place between 4 and 6 October in the False Bay area. Exercise Ibsamar VI was concluded on 12 October with a debrief onboard INS Kolkata.